Jeff Cohen, media critic and lecturer, was founding director of the Park Center for Independent Media at Ithaca College, where he was an associate professor of journalism. He founded the media watch group FAIR in 1986, and cofounded the online activist group RootsAction.org in 2011. Cohen has coproduced documentary movies, including “The Corporate Coup D’Etat” and “All Governments Lie: Truth, Deception and the Spirit of I.F. 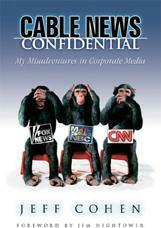 Stone.” He is the author of Cable News Confidential: My Misadventures in Corporate Media. He has been a TV commentator at CNN, Fox News and MSNBC, and was senior producer of MSNBC’s Phil Donahue primetime show until it was terminated three weeks before the Iraq invasion. His columns have been published online at such websites as HuffPost, CommonDreams and Truthout—and in dozens of dailies, including USA Today, Washington Post, Los Angeles Times, Boston Globe, Atlanta Constitution, and Miami Herald.